Billed as "one of our great provocateurs" by his latest employer, Keith Olbermann will next be landing at the so far little-watched Current TV. The oft-bombastic host of MSNBC's Countdown, who was dropped by the network last month, now will have former vice president and 2004 Democratic presidential nominee Al Gore as one of his bosses when his new weeknight show premieres sometime this spring. Olbermann told TV writers in a teleconference that he sees the program as "an improved, and we hope amplified and stronger, version of the show that I just did." Gore, in a companion statement, said that "in a world where there are fewer and fewer opportunities to hear truly distinct, unfettered voices on television, we are delighted to provide Olbermann with the independent platform and freedom that Current can and does uniquely offer." Currently available in about 60 million U.S. homes (compared to MSNBC's 85 million), Current has been averaging just 23,000 viewers in prime-time, according to a tweet by veteran media researcher Brad Adgate. 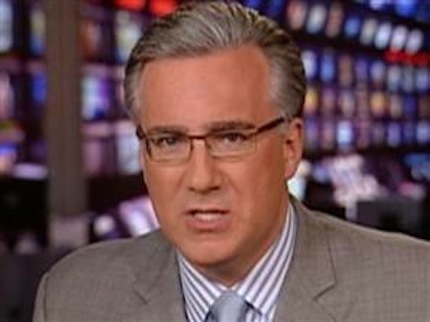 Olbermann's Countdown drew about one million viewers per program. Olbermann's recurring battles with his MSNBC bosses reached a head after he was suspended for two days for contributing to several Democratic candidates. In a separate statement Tuesday, he said, "Nothing is more vital to a free America than a free media, and nothing is more vital to my concept of a free media than news produced independently of corporate interference." At Current TV, he'll also be the Chief News Officer and have an equity stake in Current Media, the network said. Current was launched in 2005 by Gore and Joel Hyatt, who billed Olbermann on Tuesday as "one of our society's most courageous talents. He speaks truth to power. He calls them as he sees them." Olbermann, 52, came to fame as an ESPN Sports Center anchor with Dan Patrick before eventually leaving the network and trashing it publicly. He also had two separate tenures at MSNBC and worked briefly for Fox Sports, which fired him. But Olbermann lasted eight years in his second go-around with MSNBC, building Countdown into the network's signature prime-time attraction and spurring a concerted tilt to the left that later led to the hirings of Rachel Maddow, Ed Schultz and Lawrence O'Donnell. His pitched battles with Fox News Channel, and in particular with Bill O'Reilly, no doubt will be sanctioned if not encouraged by Current TV. In its Tuesday announcement of Olbermann's hiring, Current lauded his "verbal pyrotechnics and moral passion." ***CBS has ended Sean McManus' six-year dual reign as president of both the news and sports divisions. He now will be chairman of CBS Sports, with 60 Minutes executive producer Jeff Fager becoming chairman of CBS News while David Rhodes, formerly head of U.S. Television Operations for Bloomberg, named as president of the news division. ***The second national Glee cast concert tour will be without a stop in Dallas -- or Texas for that matter. The 16-city jaunt begins on May 21st in Las Vegas and ends on June 18th in Uniondale, NY.